I thought maybe I'd send my A700 back to Sony for repairs, it's out of warranty as I bought it in 1/08. I'm having problems with the control dials and wide auto-focusing. The Sony service department informed me they charge $458 for a "flat rate" repair, which doesn't include "excessive wear" from misuse or commercial use, repairing that'll cost extra. I asked them to try and define "excessive wear," unfortunately, they declined. I've got about 22k shots on it, but I wouldn't consider that excessive-but they may. If I send it in, it might end up costing me almost the same as a new one, which now retails for $899. What bothers me is the warranty is only 90 days, and if anything goes wrong after that period, I guess you pay another $458+shipping. If there's anything that's excessive, it's the repair charge. I'm lucky I have another camera. I think I'll try to get by as long as possible with the problems, then buy a new one when it gets replaced(!). FYI, the A900 costs $508 for the "flat rate repair." I've finally completed the Sony Carl Zeiss 16-35mm F/2.8 SSM ZA review. It's a long one, and I'm including a little more information, with slightly larger image crops. The super expensive CZ 16-35mm F/2.8 turned in a very good performance. If you're a rich amateur, go ahead and buy it. If you need to justify the cost some how to your wife, or may have trouble parting with two grand, you might want to hold off for a couple of weeks while I work on a comparison review between that lens, the Minolta AF 17-35mm F/3.5 G, and the Konica Minolta AF 17-35mm F/2.8-4. I shelved the idea last month, but now I'm interested in the comparison review again. I may be able to save you a substantial amount of money depending on what lens characteristics are important to you, and how you'll most likely use the lens. Since many people are likely to ask, I'd say the Minolta AF 17-35mm G lens has slightly less distortion than the CZ 16-35mm using a full frame camera. I've also noticed some other interesting tidbits, which is why I'm now going to do the comparison review. I'm adding another owner's manual to the Minolta AF lens manual page, at the bottom. This one covers a bunch of prime lenses, in a bunch of languages, and dates from 1985. It also has specifications for each lens listed. I doubt you'll learn anything new about your lens, but it's still fun to see the original manual. This manual was scanned and sent by a thoughtful reader, Jan, from the Czech republic. Check out the new "Bokeh sampler page." I think you'll find some interesting comparisons and tidbits about Bokeh, which is the character of out-of-focus highlights, and how they are rendered. Bokeh can change with aperture, focal length, (zooms), from foreground to background, and from image center to corner for starters. Bokeh is very complex and mysterious, and as a result, I have plenty of "pichers" so everyone can understand at least some of it, including myself. I also discus the cause of the bewildering "swirling" or "spinning" bokeh which most people are unaware of. This new page will be listed in the Lens reviews page, under Sigma/misc reviews. One of my visitors says he bought a new Sony A850 this weekend, so I guess Sony released some before they did themselves...odd. You never know what they're going to do. 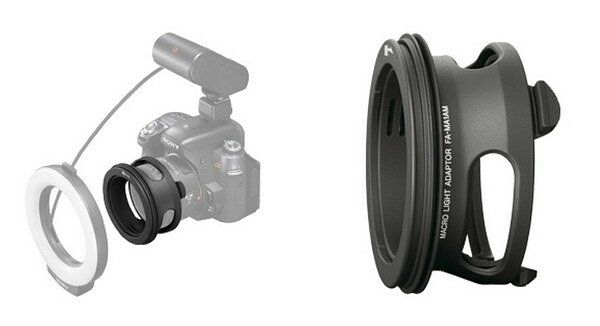 Hopefully, the two new lenses will be available shortly. Time for a random thought, because I have nothing else to offer at the moment; Sony has this Macro light adaptor in their catalog now. It's purpose being so you can use the Sony DT 50mm F/1.8 SAM or Sony DT 30mm F/2.8 Macro SAM lenses with the macro ring light, (not the twin flash lights). I see a concern right off. If you look at the dimensions of this adaptor, and the close focus distance of the 30mm macro lens, it seems there may not be enough room to illuminate the area closest to the lens when utilizing the largest reproduction rate, or full 1:1 macro of the lens. Common sense tells us the close focus (extension) lens-to-subject distance will be around 1" (25mm). By looking at the left mock-up image below, It doesn't look like it offers enough room. I guess we'll see shortly. Obviously the 50mm F/1.8 SAM will have plenty of room. This item goes on sale 11/30 for a retail price of $80--ripoff, (sorry, but it's just a piece of plastic!) Also, the A850 is in stock with an estimated ship date of 9/20, so says the SonyStyle.com website, B&H photo shows October for shipping. Check out the Minolta AF 50mm F/3.5 macro review. This light-weight and initially low-price macro lens was not very popular with Minolta AF users, and as a result, prices are steep for this somewhat slow, half-size macro. It's also one of the few lenses where Minolta wrote the filter size on the barrel. 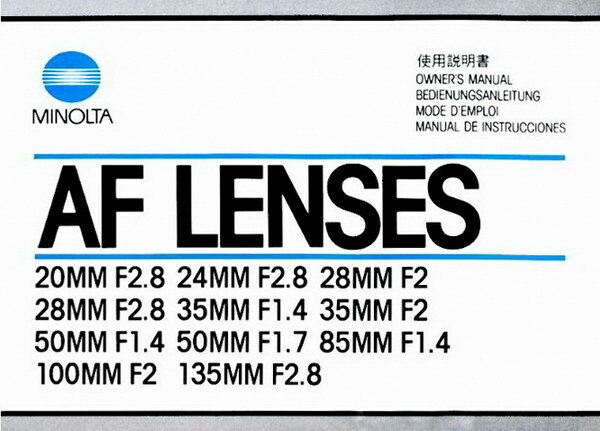 A good trivia question would be, "how many Minolta AF lenses have the filter size written on the barrel"? I'm thinking 7-8. I've included a bonus section in the review comparing this lens to the Sony 50mm F/2.8 macro. There are a couple of outstanding characteristics of this lens; the distortion is flat, even with full frame coverage, and color fringing is very low. Unfortunately, there are a few downers as well, including very soft corners with full frame use. On an APS-C camera, this would be a good pocket macro for field work, but that may be short lived depending on how the new Sony DT 30mm macro performs. Thanks to all the people that took the survey. The survey is now closed, and it didn't take long to reach the 100 response limit with my free trial plan. I think it went well, and I plan on doing a more thoughtful and extensive survey in the near future. The final results are displayed below with the top three in colored text. Responders could pick up to three lenses, and the total count is 282. Funny, but some of the most popular lenses in the survey are ones that I wouldn't have thought people would be interested in. Check out the one question survey, which lists 20 lenses, and asks which ones (up to three) you'd like to see reviewed. Click here to take survey, closed. I don't know if I'll actually be able to do a review of the top three, so we'll just cross are fingers. This is my first survey, so I'm starting off with a particularly easy one to see how the company, and process works. If sucessful, I'll work up something a little more in-depth for next time. I've added yet another new page to the site, it's called the Sony and Minolta DSLR brochures page, and it contains PDF pamphlets from Sony and Konica Minolta with current and past lenses and other accessories. So far there are only two. If you have other relevant brochures of this type, please contact me to see if I can use them. I'm only adding stuff that isn't normally available on the web. For some reason, Sony is behind on their website information, or doesn't have the brochures here posted, or doesn't feel the need to offer them, oh well, I guess I'll do it for them since I'm such a nice person. Other nice people are Michel from Holland, and Miguel from Norway, both of which I'd like to thank for scanning and converting the files for the new page. Also thanks to Theo from parts unknown for a scanned copy of the Minolta AF 500mm reflex lens, which I've added to the Minolta AF lens manuals page. Sending useful information like this is a good way to help support the site, and continue to help others. I've added the link to the Sony DSLR Global site to the box above, in green text. The link takes you to the lens section, but there is a tab for regional markets, cameras, lenses and accessories. I'm adding it just for convenience, as sometimes I like to check things out while I'm messing with the site. Just a random thought; it's been almost a year since Sony let the 24-105mm F/3.5-4.5 die. It took almost a year for the stock to disappear, It isn't even available now from most stores (at least in the US). Of course, you can still get it used on eBay. I thought we'd get some news about a new mid-range zoom to replace it, but instead it's the 28-75mm F/2.8, mentioned by me a few days back, and affectionately refereed to as the same tamron, or Konica Minolta from yesteryear. We'll see. There was some talk about a 24-105mm F/4 SSM back about a year ago, so I guess that rumour was bad. I sent the home page news from May and June to the home page archives, so if you saw something from those months, and now you can't find it, check the archives out first.